At the Neil Armstrong Airport, we have several hangar layout options. Are you looking for somewhere in Central Northwest Ohio to locate your aircraft? 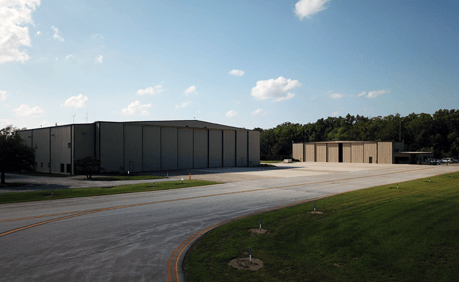 The Auglaize County Neil Armstrong Airport may have the right hangar to fit your needs. From the Basic T-Hangar to Large Corporate Facilities the Auglaize County Neil Armstrong Airport offers close to 100,000 square feet of hangar space to local tenants. Hangar A has capacity for two aircraft, 40ft wing span and less. Tail heights less than 12ft. Door sections are manually operated on slides. Hangar B has capacity for four aircraft. The hangar has two sections, with capacity for two aircraft within each section. Electrically operated doors. Hangar D is comprised of two sections. The first has room for two aircraft and has an electrically operated bi-fold door. Wingspan 50ft or less, tail height 13ft and less. The second (nicknamed the "Chicken Coop") has parking for 6 aircraft and is built as interior common space. Door sections are manually operated on slides. Aircraft sit on concrete pads surrounded by stone. Wingspans less than 40ft and tail heights below. Within the Hangar D block, we have two immediately available openings. We have two openings in the common space area. A hangar wait list is available, should you desire a hangar within one of the others listed above. Please Contact the Airport Manager for more information at: 419.753.2810.